Mount William (also Mount Duwil) is located within the Grampians National Park, approximately 250 kilometres west-north-west of Melbourne. 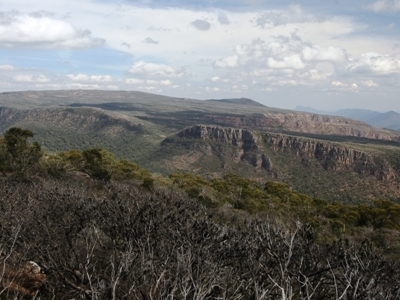 It is situated on the eastern edge of the national park, approximately 22 kilometres drive from Halls Gap.Mount William is the highest point within the Grampians National Park. Three transmission towers are located at the summit of Mount William. A sealed service road continues to the summit, but is not accessible by vehicle to the general public.Visitors to the mountain can drive to a carpark located approximately 920 metres up the mountain, before proceeding on foot for 1.8 km to the summit. It will take a person of moderate fitness approximately 45 mins to walk. No permit is required to climb the mountain. Here's the our members favorite photos of "Peaks or Summits in Victoria". Upload your photo of Mount William (Mount Duwil)!